A simple dessert that people love! You can use anything you want in place of the toffee: sprinkles, nuts, cookie crumbs, or whatever! This is also really good with dark chocolate. Spoon a thin layer of peanut butter on top of each banana slice. Insert a toothpick through the peanut butter layer into the banana. Place banana bites onto the prepared baking sheet; freeze for 30 minutes to overnight. Melt chocolate and shortening in the top of a double boiler over simmering water, stirring frequently and scraping down the sides with a rubber spatula to avoid scorching. Cover another baking sheet with waxed paper. 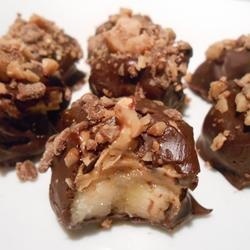 Remove 2 to 4 banana bites from the freezer at a time; coat each bite with chocolate mixture. Place coated banana bites on the second baking sheet; sprinkle each with toffee bits. Repeat until all the bites are coated. Return banana bites to freezer until set, at least 1 hour. Allow bites to sit in room temperature for about 15 minutes before serving.